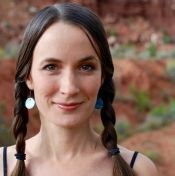 Typing on computer keyboards, thumbing away at our smartphones, driving, cooking, and hobbies from knitting to foosball can all exact a toll on the hands and wrists, as can our yoga practices. While the version of wrist extension most often practiced in yoga—palms on the floor, and fingers forward (think plank)—is a healthy position in which the hands can practice weight-bearing, it is only one of many positions of which the hands are capable. Throwing in the occasional hand-under-foot pose, peacock pose, or reverse namaste can be helpful, but it is often not enough for most students to counter the effects of scores of vinyasas—with plank-style wrist extension repeated over and over, and often while the hands are not bearing weight as effectively as they could. The practice below is designed to bring your hands and wrists into optimal alignment and to guide them through a wide range of healthy movements. When working with the hands and wrists this carefully, you’ll also be strengthening your forearms, upper arms, and shoulders. Though it is given as a stand-alone practice to be done with the help of a wall, you could easily incorporate into your regular yoga practice those actions you find most valuable. I also make suggestions throughout for poses with which these movements can be combined. A few things to keep in mind as you move through this practice: Don’t rush. Instead, imagine that resistance is slowing the movement of your hands. Keep your shoulders up and back, with shoulder blades against your back (instead of pulling them down; most of us wear our shoulders too low), and avoid hyperextending your elbows in the poses where your arms are straight. For more intensity, try firming the forearms toward each other (as if squeezing a block), and widening the upper arms away from each other (as if trying to break a strap). Back off any movement that causes pain, tingling or numbness—return to the point in the movement before those sensations began, and work at that point. Take breaks whenever you’d like, rolling your shoulders and shaking out your hands and arms. While the practice below has the potential to help those with arthritis or carpal tunnel syndrome, students with these conditions should progress slowly—starting with just a few of the recommended movements, and only a couple repetitions of each. If the practice agrees with your hands and wrists, you can then increase the vocabulary of movement and number of repetitions. 1. 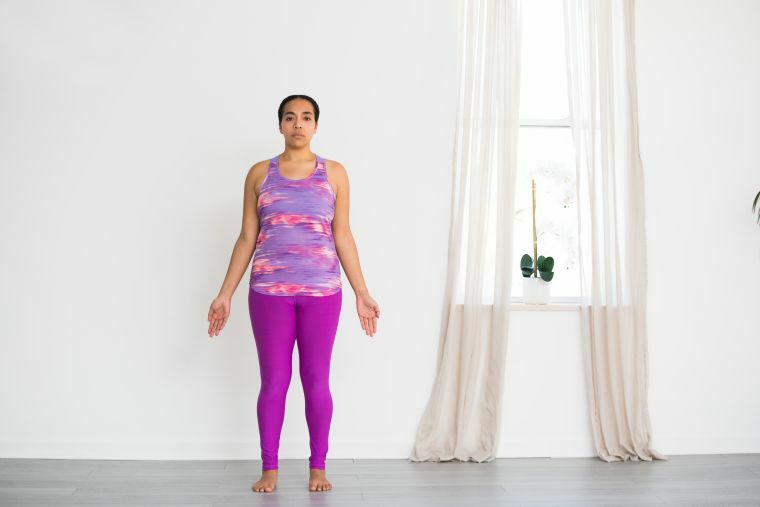 Stand upright in mountain pose with your arms alongside you, palms facing forward. Although your hands are not pressing into anything here, arrange them as if they are pressing into a flat surface with every knuckle, as well as with the inner and outer “heels” of the hands (the part of the palm near the wrist). Settle even your fingertips against this imaginary surface, instead of hyperextending (i.e., curving your fingertips back toward you). While keeping your shoulders up, back, and against your back, reach your fingertips toward the floor. Do not deviate your wrists to “tick” your hands in toward your thighs or “tock” them out away from you, but rather arrange your hands so that each of your middle fingers follows an imaginary line running down the center of its respective forearm. Create a smooth plane between between your forearms and your hands, with no crease at the front or back of the wrist (avoiding any “kink in the hose” that interrupts the connection of your arms to your hands). Hold this position for several breaths. Try applying this alignment when stretching your arms behind you for locust pose or warrior III! 2. Continue standing in tadasana, with palms forward. Now make fists with the thumbs outside the fists and curled on top of the index fingers. Then, without moving your arms, curl your fists forward as if trying to bring your knuckles to touch your inner wrists. Holding your hands in fists, repeat these wrist curls a few times. And anytime you are seated in staff pose, try curling your fists forward and holding them in that position, while you press down into the floor with the back of your hands! 3. Stand facing a wall. Place your palms on the wall in front of you at shoulder height and about shoulder-distance apart (fingers pointing up, wrists parallel to the floor). Bring your fingers close together, thumbs cuddled alongside the index fingers. This hand position has the potential to move your thumb deep into its socket, and to widen the palms (especially the heels of the palms, just above the wrists) more effectively than just spreading the fingers wide. Instead of hyperextending your thumbs, be sure to bring the tips of your thumbs against the sides of your index fingers. Keeping your shoulders up, back, and against your back, press your hands into the wall as fully and as evenly as possible. You want the bases of your index fingers (and indeed, the bases of all your fingers and your thumbs!) to press against the wall—along with your knuckles, all of your fingertips, and the inner and outer heels of your hands. Can you press through the thumb knuckles? Through the bases of both ring fingers? Spend several breaths gluing your hands to the wall. And try using your hands this thoroughly in every downward and upward facing dog! 4. Still working with your palms at the wall, turn your fingers to face down (or out to the sides if they don’t turn down all the way). Keeping your shoulders in place, and trying not to let the elbows hyperextend or veer in toward each other, root through as much of the hands as possible—starting with the fingertips and knuckles, then the bases of the fingers, and gradually moving weight toward the heels of the hands. Stay here for several breaths. And try flipping your wrists like this in tabletop or even plank pose! 5. Move away from the wall. Hold your right arm out to your right (as you would in warrior II), but then press your palm away from you (extending the wrist) as if signaling someone to stop. Imagine pressing your hand and your fingertips into a wall, rather than allowing your fingertips to hyperextend (curve back toward you). Now, holding your arm still, and moving your hand as a flat and unbroken unit, aim your fingertips toward the floor (flexing the wrist), then move them up toward the ceiling once again. Tip your left ear toward your left shoulder for more intensity, while you repeat this slow flap of the hand a few times (if you’d like, bring the left hand to your head just above your right ear to gently weight it). You can also repeat the exercise a couple of additional times while making a fist. Then practice the exercise on the left side as well. And apply to warrior II! 6. Move your right arm and hand out to the right, as if doing warrior II again, but now turn the palm to face up (imagining that you’re holding a platter). Then, keeping your palm up and moving your hand as a single unit, tip your fingertips toward the floor, extending the wrist, then back up toward the ceiling, flexing the wrist. Repeat a few times, moving your left ear toward your left shoulder for more intensity (and, if you’d like, gently weighting your head with your left hand). You can also repeat the exercise a couple of additional times while making fists. Then practice the exercise on the left. Apply to warrior II as well. 7. Reach both arms out straight in front of you at shoulder height, and turn the palms up, as if holding a platter. Evenly settle your palms and your fingertips against this imaginary platter. Now, keeping the wrists flat, rotate your palms down, imagining that you’re pressing them against a countertop (your fingertips too!). Flip your palms back up (supinating the forearms), and then turn them down (pronating the forearms), making sure to keep the wrists flat as you repeat a few times. Apply to chair pose, while stretching your arms straight out in front of you! 8. Lengthen both arms out in front of you at shoulder height. Turn the palms up, again holding your invisible platter. Keeping the line from the back of your hand to your forearm smooth (no wrist creases), draw your index fingers and thumbs together like jnana mudra—lengthening your other fingers without hyperextending them, as if sending beams of light straight ahead through your fingertips. Reach your index fingers back out, and draw your middle fingers in toward your thumbs. Go finger by finger, until you get to your pinky fingers. Repeat a few times. And also try applying this movement to the top hand in triangle! 9. Make “robot arms,” bending your elbows at right angles against the sides of your ribs. Turn your palms to face each other, as though holding a block. Keeping your forearms absolutely still and your hands parallel (do not crease the wrists), tip your hands up on a slight diagonal toward the ceiling (a position called radial deviation), and then slant them down on a slight diagonal toward the floor (a position called ulnar deviation). Repeat these slow, careful wrist deviations a few times. Also apply these wrist deviation exercises with “robot arms” while in bridge pose prep: As you lie on your back, bend your elbows to ninety degrees right alongside your rib cage. Press your upper arms against the mat, and reach your hands straight up into the air with your palms facing each other. Then, imagining that you’re holding a block between your hands, tip your hands toward your face, and then toward your knees. 10. Place your palms on the wall at shoulder height, shoulder-distance apart (with fingers pointing up, and fingers and thumbs close together). Root into the wall as thoroughly as you did in number one above, pressing through your knuckles and all of your fingertips. Without uprooting any other fingers or your palms, walk your thumbs toward each other. Reroot through your hands. Without disturbing the rest of your hand or hyperextending any of your fingers, walk your index fingers toward your thumbs. Continue, moving finger by finger, until your pinky fingers have also moved. Then walk your fingers back, starting with your pinky fingers. Repeat. Also apply to sphinx pose, or to tabletop on your forearms. 11. Lie down for savasana, rubbing your hands together to warm them and then relaxing with your arms comfortably outstretched, palms facing up. Aim to make the thumb sides of your hands as heavy as the pinky-finger sides of your hands. If there are creases at the back of your wrists in this pose, put blankets, towels, or eye pillows underneath the backs of your hands to smooth the line from forearm to wrist. Stay here for as long as you’d like, imagining the petals of your palms unfurling. If the movements above are challenging, repeat them often and include them in your yoga practice. But also look at what your hands are doing throughout the day, and throughout your yoga practice. Try to smooth out the line from forearm to hand, eliminating any unnecessary crease in your wrists while you type, drive, pick up a pot from its shelf in the cupboard, lift dumbbells, grasp a strap behind your back, or hold your fingers in a mudra. Notice too if your hands tend to “tick” or “tock” right or left in certain yoga poses—for instance, as you reach an arm overhead in extended side angle, or as you bring your elbow outside your knee in marichi’s twist. Instead, do your level best to create an unbroken line from the center of your forearm through the middle finger. Keep an eye out for hyperextension—are you flaring your fingertips up in warrior II, for instance? Settle your fingertips down. And whenever your hands are on the ground (or against a wall), make full use of them. In poses like tabletop and chaturanga, instead of letting your weight shift to one side of your hands, root down with all of your knuckles and fingertips, as well as with the inner and outer heels of your hands. Paying attention to these details will pay off in long-term hand and wrist stability, while offering a new avenue for growth and exploration in yoga poses you thought you knew like the back of your hand.